I’ll be celebrating on 6 December as my fifth book will have been published. Five books seems like an extraordinary number to me. I’m no Barbara Cartland, knocking out ten books a year (or whatever), but it does mean that I’ve dealt with all the issues and complications that arise from making one book, five times over, since 2007. That’s a point worth celebrating right there! 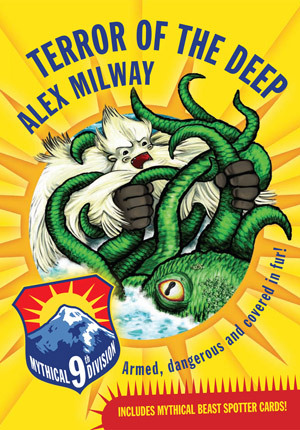 The Terror of the Deep, the second of the Mythical 9th Division series is probably my favourite of all of the five, simply because it’s the one where the art is really starting to work with the text as I’d always hoped it would. Everything takes time to evolve and grow up, and I’m finally feeling more confident about my illustration. I’ll never be Tenniel, but I may just one day be Alex Milway. And so enough about that. This blog is now live, and the one where I’ll be posting from now on. It’ll take a while to look right, and I’ll twiddle a few setting till I’m happy, but I might even try to compete with Sarah McIntyre for frequency (NAH! Who am I trying to kid!?). 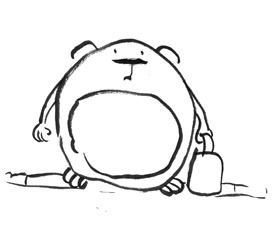 And while I’m there I should say that her marvellous Morris The Mankiest Monster deserves to win every award going, not just the Sheffield Children’s Book Award that it won yesterday. Fabulous news! And so, as a parting gift, here’s a hamster carrying a lunchbox.